DUFOUR - Carte de la Chine. DUFOUR, A.H. - Carte de la Chine. Carte de la Chine. - DUFOUR, A.H. 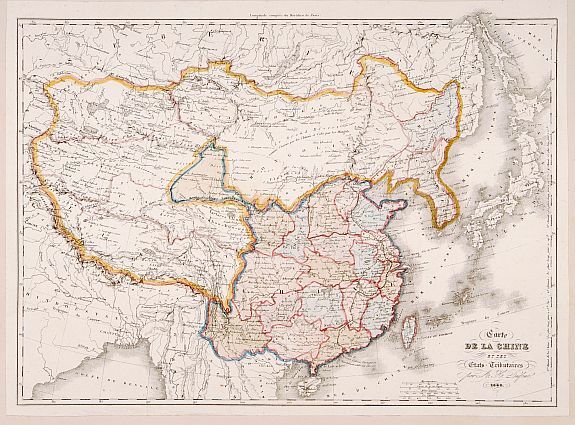 Title : Carte de la Chine.. Size : 10.2 x 14.1 inches. / 26.0 x 35.7 cm. Description :Detailed map of China, Taiwan, Korea and Japan, prepared by Auguste Henri Dufour (1798-1865). The map is of interest for the use of Yellow Sea, the sea between Korea and Japan, here called "Mer de Corée". Condition : In very good condition. Contemp. pasted on a larger sheet of paper.